Our dual action formula of natural cranberry fruit concentrate and hibiscus extract offers urinary tract cleansing and support. 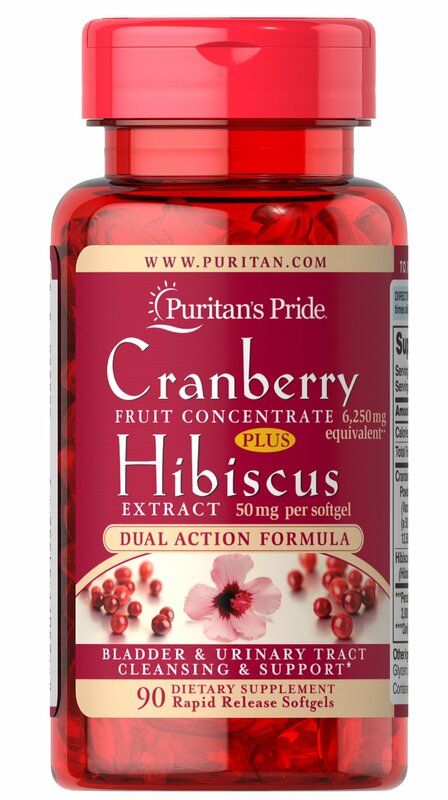 ** Each serving contains 250mg of cranberry concentrate powder, a 50:1 concentrate equivalent to 12,500mg of fresh cranberries, plus 100mg of hibiscus extract. Cranberries support urinary tract and bladder health. ** Includes 90 rapid release softgels. No Artificial Flavor or Sweetener, No Preservatives, No Sugar, No Starch, No Milk, No Lactose, No Gluten, No Wheat,No Yeast, No Fish. Sodium Free.